Lithuania’s significant increase in defence spending has been praised by NATO Secretary General Jens Stoltenberg as an example this week. 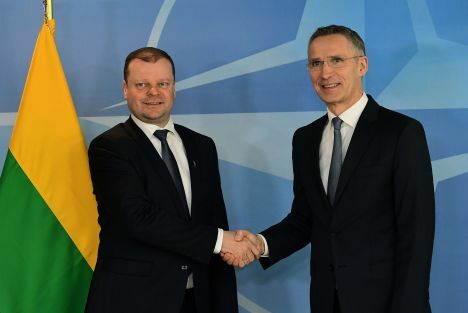 The military alliance wrote in a press release that Stoltenberg hosted Lithuanian prime minister Saulus Skvernelis at NATO headquarters on Monday, November 19, and during a joint press conference thanked for Lithuania’s contributions to the alliance, for instance, in the form of peace keeping missions in Kosovo and Afghanistan. «You share expertise on energy security through the NATO Centre of Excellence in Vilnius. Lithuania also leads by example on defence spending. Investing in major equipment. And committing to spend 2% of GDP on defence this year,» stated the NATO Secretary-General. The two leaders met to discuss NATO’s continuing adaptation to the security situation in Europe, the alliance wrote in its press release. Outgoing Lithuanian President Grybauskaitė: independent and tough, but lacking a vision?